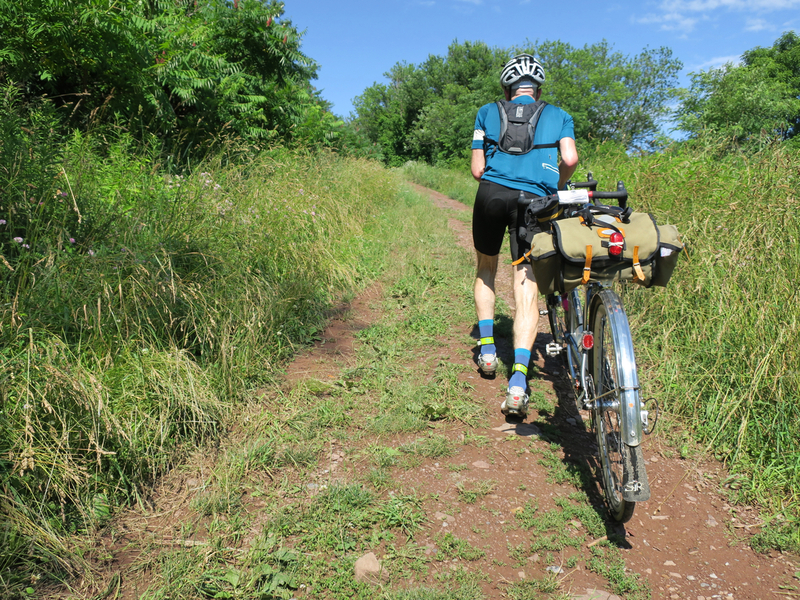 We’ve been fortunate to make riding friends who are great routers – the folks who know how to connect the region’s vast number of back roads into long rides that venture far from the highways. They are also great at finding the steep hills that lead to the best views! Eric and Mary at 5 a.m.
On Saturday we joined up with one of our close pals, Eric Pilsk, who came up with a 192-mile loop ride from Hagerstown, Md. 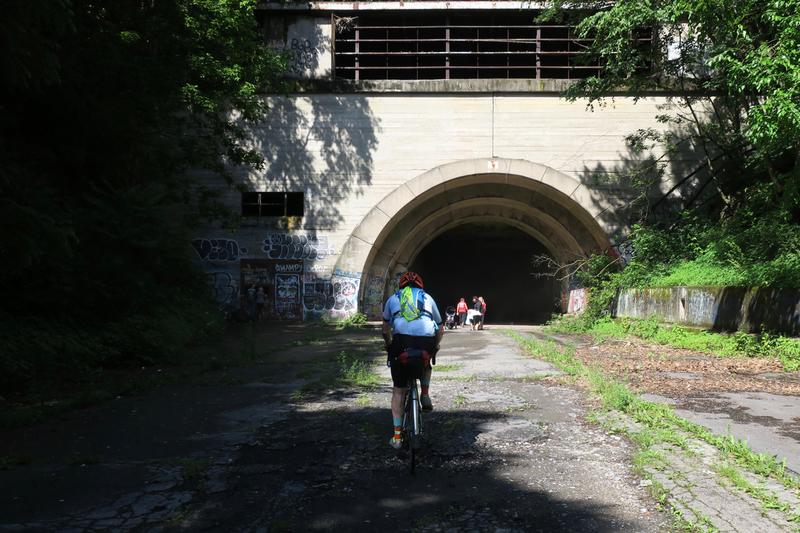 into the southwestern Pennsylvania mountains that included the abandoned section of the Pennsylvania Turnpike. I dubbed the ride the Abandoned Turnpike 300K. You can see it on Ridewithgps here. One note, it has an error somewhere, it would not load the exported GPX file on my Garmin Edge 1000 though Mary’s Edge 810 loaded it without an issue; probably a maps incompatibility on the 1000. 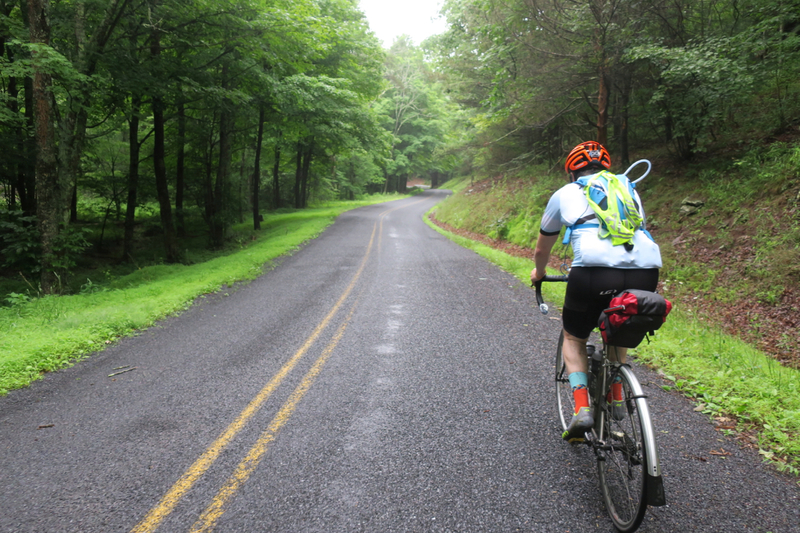 It’s a climber’s feast, with more than 14,000 feet of climbing over 23 ascents, including the steep, long grind up Rainsburg Gap before Bedford, Pa.
Our Garmin Connect file has our final ride info, showing the 177 miles we actually rode because we shortcut back to the start. Read on for the details! This was our second of four training weekends for the upcoming Coulee Challenge 1200K. We’ve got a multiday rountrip to Pittsburgh from Cumberland, Md. this coming weekend and then something close to a two-day 600K in mid-July. We met Eric at 5 a.m. Saturday at the Valley View Mall in Hagerstown in misty conditions, hoping the forecasted rain showers would go elsewhere. That would be largely the case, but other circumstances would come into play that would make rain seem trivial. The initial 32-mile segment through eastern West Virginia to Hancock, Md. was misty and full of wet roads as the hills gave up the recent rains to the Potomac River. 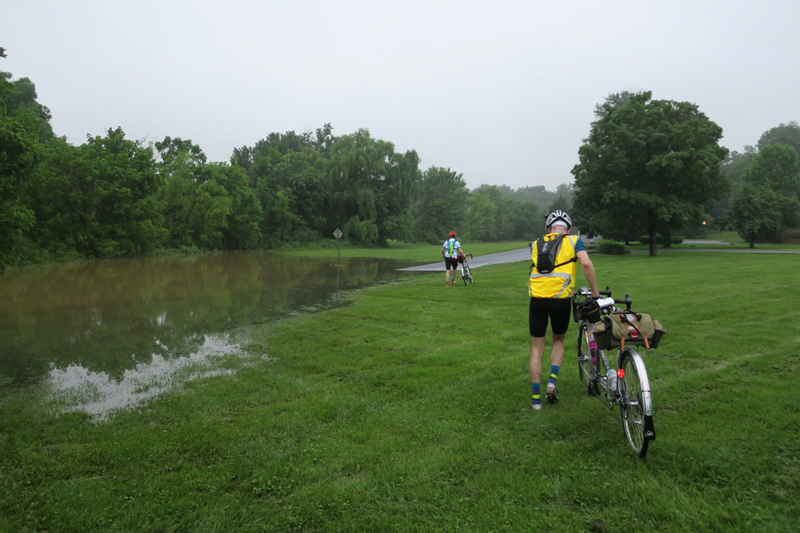 Our progress was good except for slowing to traverse – or go around – small flooded road sections. We also had to unwrap the chain from around Mary’s crankarm after an overshift to the big ring. Last week I sorted out our spare chain links, which was timely because I had to break the chain. The one thing about tandems is the power from two people usually makes drivetrain foulups worse than single bikes, but this time we stopped pedaling in time: the chain was still intact and we didn’t damage the rear derailleur or tear it off the frame. 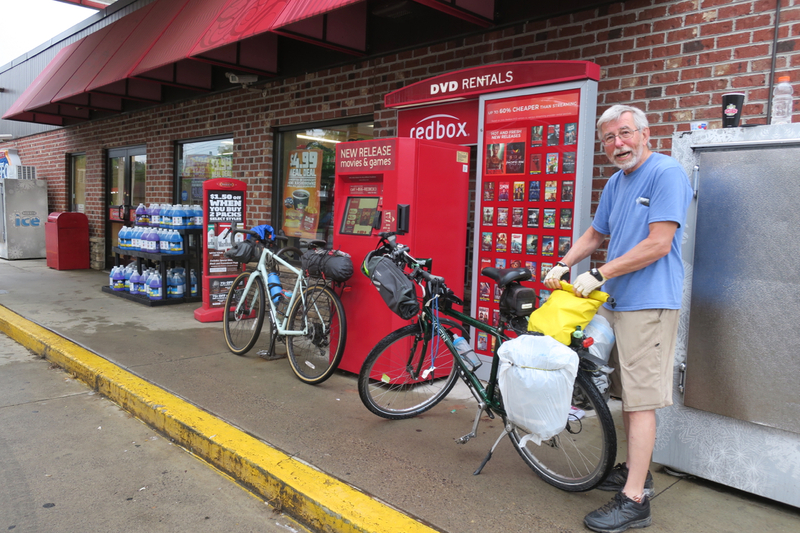 After a brief stop at Hancock, where we talked to a pair of guys riding the C&O Canal Trail to the GAP Trail to Pittsburgh, we moved into Pennsylvania to take on the big hills to lunch in Bedford. Our average speed fell on this section as we ascended up one grade after another in fog and mist. The climb over Rainsburg Gap at mile 68 was an all-out granny ring affair as we dragged ourselves up to the top at 4 m.p.h. 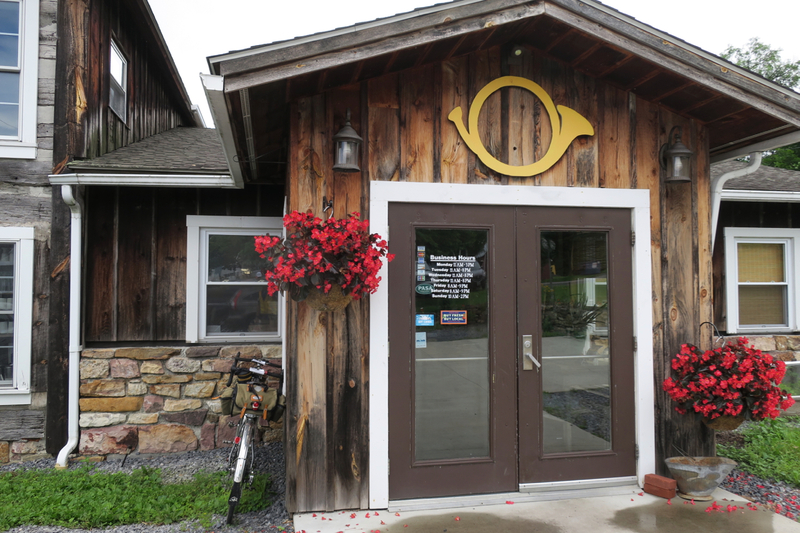 The payoff was a fine lunch stop in Bedford at Horn o’ Plenty, a locally-sourced restaurant that takes awhile, though the food is amazing. We needed to stop and get sorted out for the rest of the climbing to come, so an hour off the bike wasn’t all bad. Our friend Jerry Seager introduced us to HoP last year with the rest of our fleche team. He is off touring the world with his partner Carolyn and we thought of him. Hi Jerry and Carolyn! With 110 miles remaining, our departure at 1:30 p.m. was not ideal, but we still had the notion of finishing in daylight. That turned out to be a happy fantasy. Time was lost in Everett at milke 95, where the main street was closed for a bridge replacement. The helpful lady in the home next door told us to just go through the neighbor’s back yard, which worked though it felt kind of sketchy. Yard walk in Everett. Blurry photo by me. Then the skies opened up for a brief shower, the only one of the day, which we waited out at the feed store. This was followed by clear skies and cooler temperatures – a welcome turn of events in terms of maintaining forward progress. More slow climbing over spectacular green hills, including some steep gravel grinding, ensued to get us to the main attraction of the day: the eight-mile section hike/bike of the 13-mile abandoned Pennsylvania Turnpike highway, with two long tunnels, between Breezewood and Sideling Hill. Enchantment at the thought of miles of carefree riding quickly vanished once we dragged the bikes up a dirt path and saw the crummy condition of the unmaintained road. The pavement has deteriorated, with lots of loose chunks and frost heaves, making for a constantly bumpy ride. 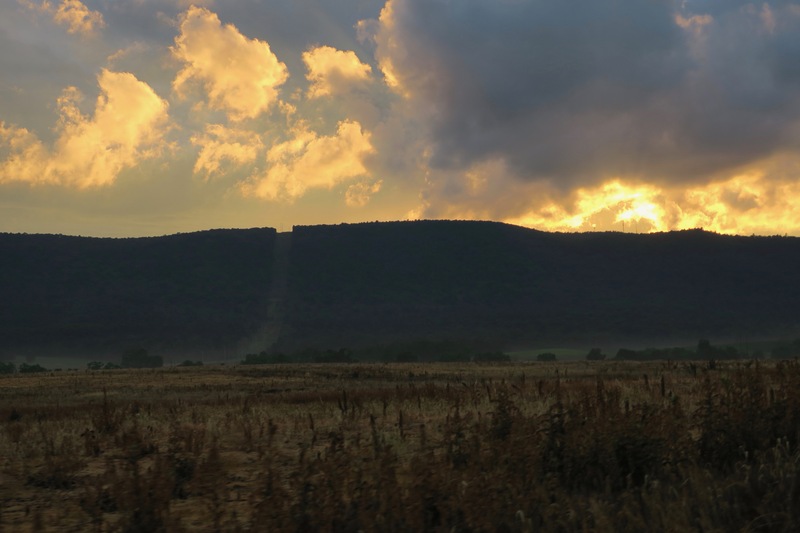 The two tunnels – Rays Hill and Sideling Hill with no lighting or active ventilation – were full of fog and very dark. The roadway, while intact, had scattered glass and fallen roof material. The walls are marred with graffiti consisting of the usual angry/sentimental/obscene sentiments. It’s no wonder this old turnpike section was used for the movie version of the apocalypse novel The Road by Cormac McCarthy. Eric slaloms in search of smooth riding. Photo by Mary. Strong lighting was a good thing to have and we got though the tunnels without any zombie attacks – or worse, a mechanical. Still, adding to the general disillusionment, back out in daylight we had to fix a front flat caused by a glass shard just a few tenths from the exit onto the real-world roads. We took our next rest stop at the current Sideling Hill rest area, adding to the fantastical turnpike-themed afternoon. Eric figured out how to get there via the employees’ service road. “Are bikes allowed on the highway?” a perplexed driver asked us as we parked the bike. 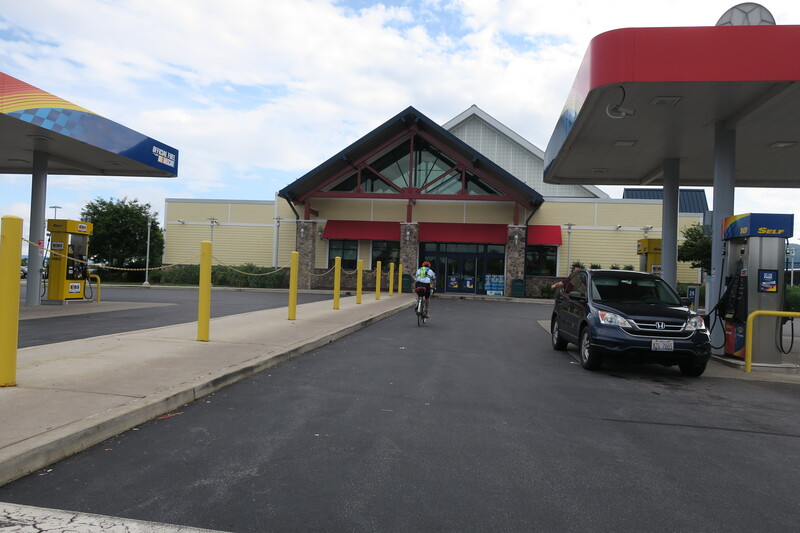 No, but we were surprised just as much to use a turnpike rest area as a food stop. Less fantastic was our slow pace. It was 5 p.m. and we had only covered 120 miles in 12 hours. We still had 70 miles to go and a lot of climbing still ahead. A midnight arrival looked like a distinct possibility. SAD FACE. Fortunately, we had the option to cut off 15 miles and took it, via the sublime Cowan’s Gap that is ascended via a gently rising road to a picturesque lake, followed by a fun twisty descent. All was fine until our front tire flatted again – another piece of debris. Thankfully we carry two tubes and after I vocally expressed my frustration the tire was fixed and we got back on the road. 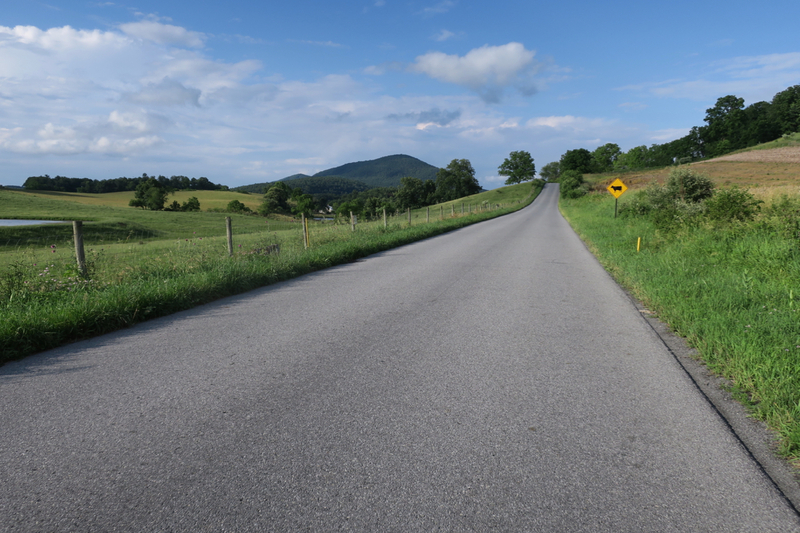 Gorgeous hills toward Burnt Cabins, Pa.
At Mercersburg a Race Across America support crew was set up by the Rutter’s store, and we went over and talked. They were the Sea to See tandem relay squad, all with blind stokers. We had quite the friendly visit with them. 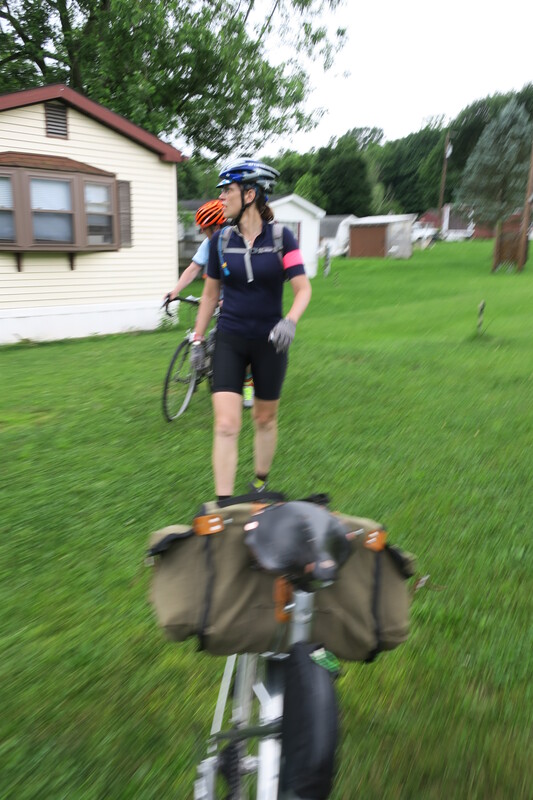 Mary remarked how it was just as normal as could be that we’d all be out at 9 p.m. on a Saturday night in a small town riding our tandem bikes, no big deal. Sunset, miles to go. Photo by Mary. We didn’t get any photos, which I’m sorry about. Off into the night we went, mowing down loads of gooey bugs attracted to our lights. Eric is a seasoned night rider and we got back to Hagerstown without any more stories to tell at about 10:45 p.m., with 177 miles done. This one got away from us, in a good challenging way. Randonneuring will sooner or later draw on your ability to deal with blown timetables and mechanicals, and Saturday was that kind of day. Eric’s company made it all good and the scenery was an added delight, one we got to savor from dawn to well past dusk. I thought we might consider this route for a brevet, but there is too much climbing (and the turnpike is a disaster). We still ended up with nearly 12,000 feet of climbing. There is probably a more reasonable 200K or even 300K in there if we can get some more valley riding. Thanks to Mary who kept us going to the very end and Eric for another memorable day on the bike on a lot of new roads. It was a day we won’t forget. 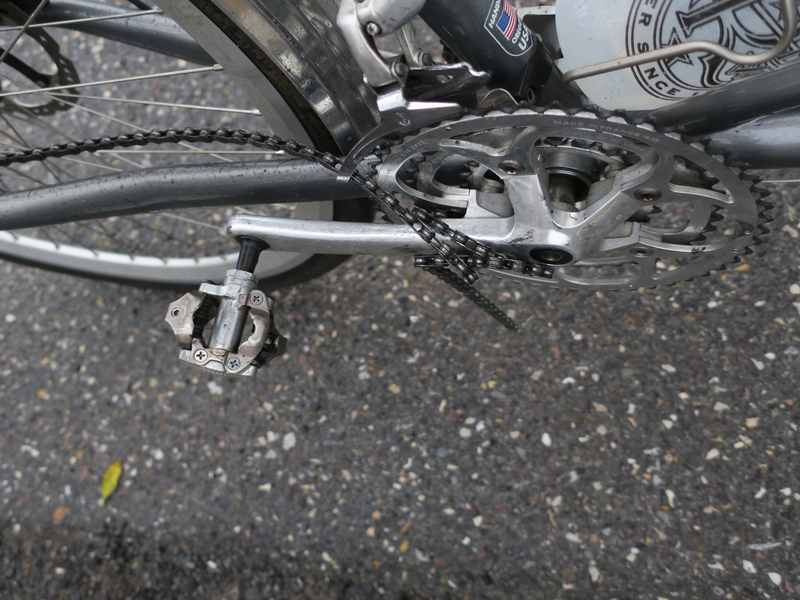 Wow, that was quite a tangle of chain on the tandem. I remember the first time we broke our chain on the tandem and it dawned on me that my ride home was there with me. Fortunately we were only a few miles from home and able to walk/coast home. I now have a chain tool and replacement link in our tool kit. 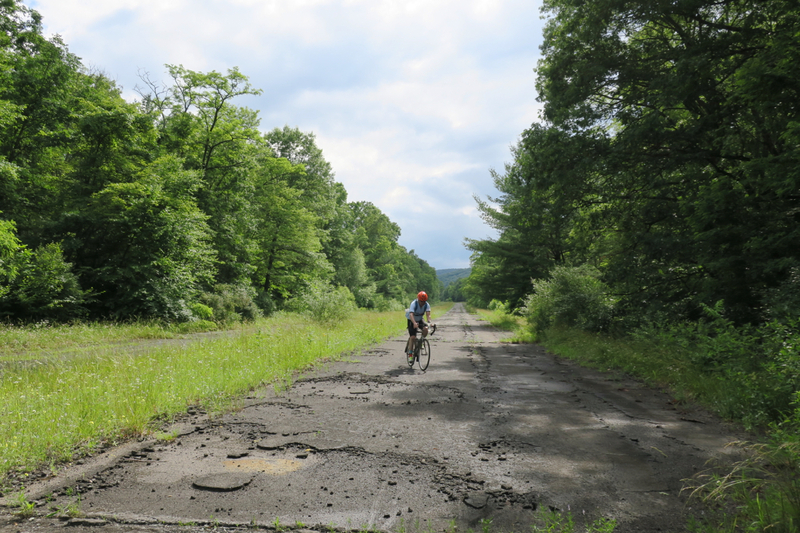 :-) I appreciate your take on the turnpike, we were thinking about adding that to a weekend ride but think we will pass on that now seeing the condition. What tire size were you using, 32? Paul, correct 700c 32mm GravelKing tires. Not nearly big enough on that section. We run 28c on our Speedster and 32c on our Bushnell. I think I could get 35c on the Bushnell, what have you used in 35c?